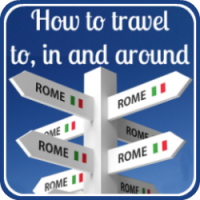 How to travel into Rome from Fiumicino or Ciampino airport. 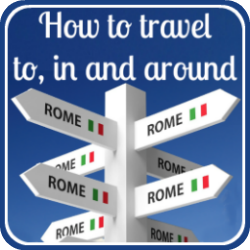 Worried about how to travel into and out of Rome from Fiumicino or Ciampino airport? Don't be! Here are five budget-conscious, safe, reliable options to help you decide which method of transport is best for you and your family. Both Rome's airports are outside the city by some way. Fiumicino, officially named the Aeroporto di Leonardo da Vinci, is the largest. It is the international airport into and out of which all flights from the United States go. It lies 16 miles south-west of Rome, about ten minutes by car from the coast. Ciampino is just off the main ring road 12 miles south-east of the city and services largely the European low-cost airlines. So whichever you're flying into, you'll need to travel into (and out of!) the city. Knowing how to do that can be a bit of a maze, especially if you're new to Rome. But there are options to suit every circumstance and every budget. This page will help you decide on the best route for you and your family to get you from the airports quickly, safely and with the minimum of hassle. 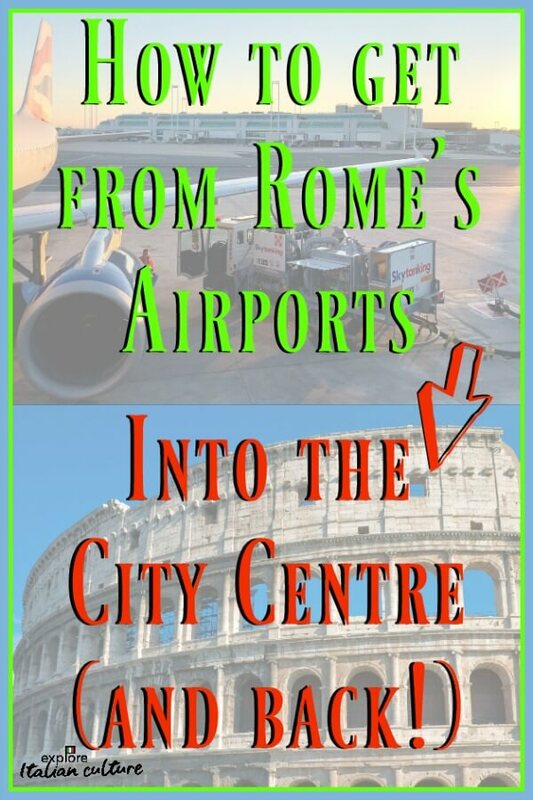 There's a lot of information here, covering both of Rome's airports, so it's quite long. To help you get to where you want to be quickly, use the links in the box below. 1. 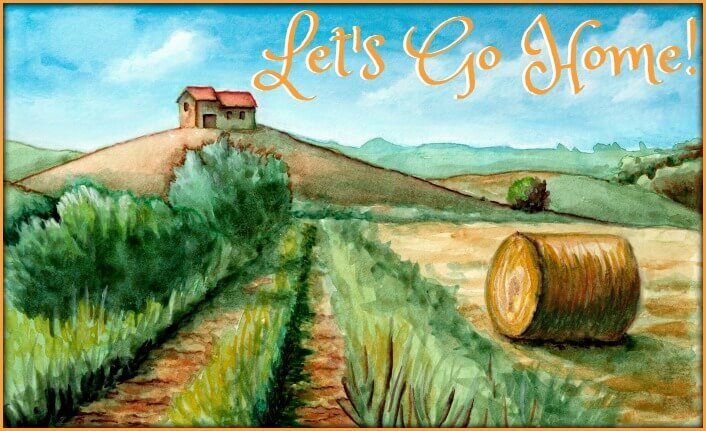 By coach from Fiumicino or Ciampino airport to and from Rome. Several companies run coaches / buses between Fiumicino and Ciampino and the city centre. The airports are more or less equidistant from the city so they all take around an hour, depending on the time of day and traffic. All the companies charge about the same. Tickets can be bought online (the quickest and most convenient) or at the airport. There are booths opposite the gates from security in the arrivals hall. In Rome you can buy from the office at Termini station. The most well known company is Terravision. They are slightly cheaper if you book online (see below), which also prevents you having to stand in the inevitable lengthy queue (line) once you're through security and customs. There's no booking fee, and you can take luggage in the hold. Furthermore, if your travel dates change, you're able to amend your dates - a definite advantage over other companies. The unmistakable markings of a Terravision bus leaving Ciampino airport, Rome. 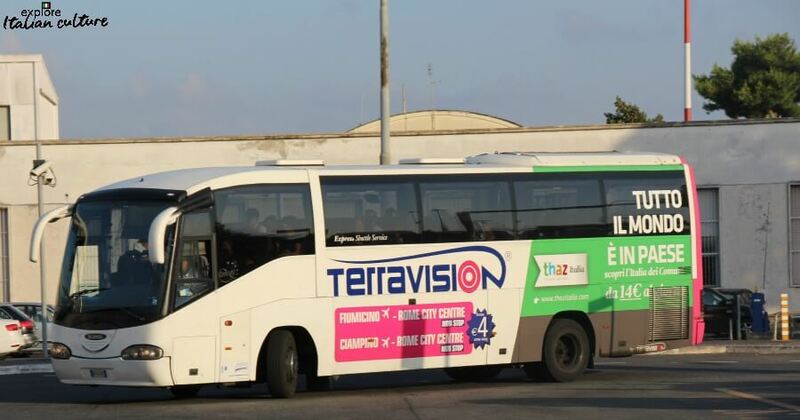 Terravision coaches (from both Fiumicino and Ciampino) run roughly every 30 minutes, but although there's a schedule they tend to leave only when full. The stand is immediately outside the terminal building at both airports - look for the unmistakable white coach with pink and blue markings (see pic above). The coaches drop off and pick up at exactly the same place outside Termini railway station on Via Giolitti 38. Below for your convenience are links from which, if you click through and buy, we will earn a small commission (at no cost to you). We are partners with and recommend Terravision because our experience over many years has been that they're the most efficient. Recently, they have upgraded their coaches, so they provide a comfortable ride. It's the company we use ourselves to travel into and out of Rome. Click the banner to book to and from Fiumicino airport. Click the banner to book to and from Ciampino airport. Book a return journey online and save €1. Download your voucher, go straight to the coach stop and present your voucher to the Terravision staff. Very inexpensive and relatively quick way to travel. 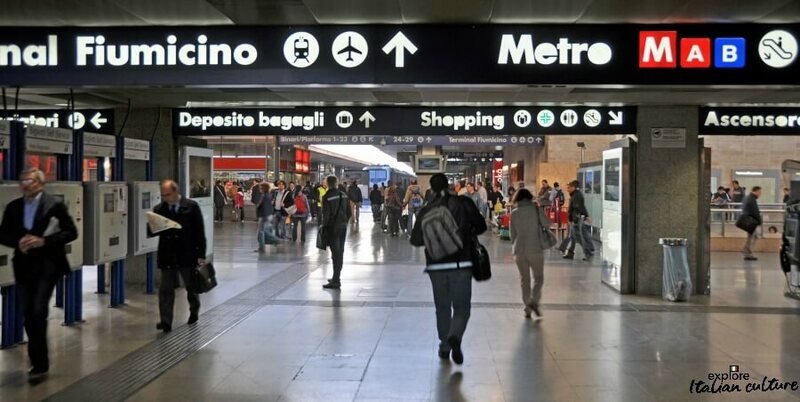 Termini is the main railway station in Rome and is a central location so from there you'll be able either to walk to your hotel or take a taxi. The coaches used to be quite old and certainly not luxurious, but Terravision have recently renewed their fleet and they're now clean and comfortable. This is the best option if you're on a tight budget. Need to allow extra time when returning to the airport. Rome traffic can make the travelling time slower than it should be. The queuing system at Termini (when you're returning from Rome to either airport) tends to be a little on the disorganised side - in fact it's not unlike a rugby scrum. Get there well before your bus is due to leave and check you're in the right queue (line). Remember to add in the cost of a taxi from the station if your hotel isn't within walking distance. 2(a). From Fiumicino airport by local train. Local trains run between Fiumicino airport railway station (directly opposite Terminal 3, next to car park 'C') and various railway stations in the city. Despite the fun often made of the Italian rail network, in our experience and that of a lot of people we've helped to travel by train, it's excellent. Trains generally run on time with surprising efficiency. In the photo below, note the ticket-punching machine at both sides of the platform. If you buy tickets at the station they must be validated by putting them into this machine - otherwise you may be fined. Tickets bought online don't need to be validated. 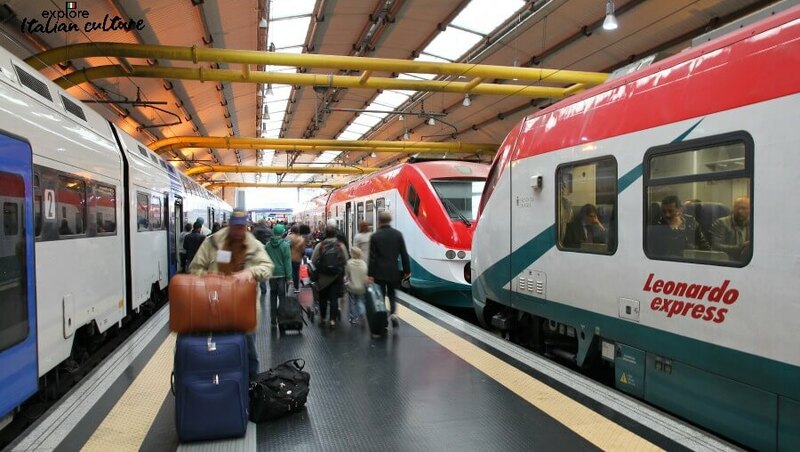 A regional train arrives at Rome's Fiumicino airport railway station - opposite Terminal 3. It's inexpensive - about double the price of the coach but half the price of the Leonardo Express. It's interesting if you like to see the areas you travel through. These trains are used by local people and as a tourist you'll always be a source of interest travelling as local people do, so you'll get plenty of chat if you want it - even if you don't speak Italian. If you're staying in the Trastevere district this is a good way to reach your hotel - as long as you make sure when you book you are choosing a train bound for Tiburtina, not Termini. The Tiburtina trains all stop at Trastevere station. Trastevere station - all local trains from Fiumicino to Rome's Tiburtina station stop here. The trains stop at every single station between the airport and central Rome - ten in all - so the journey takes nearly an hour. The trains don't finish at Termini but at Tiburtina, which is three kilometres away from Termini in the north-east of the city. So you're a little way out of the centre - it would take about 35 minutes to walk. 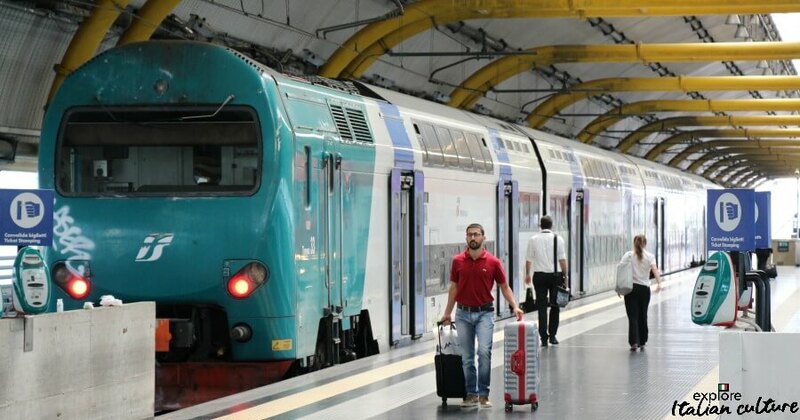 Tickets can be bought either in advance online at the Tren Italia website by following this link (this version of the site is in English but make sure you use use Roma, not Rome, in your search) or at Fiumicino airport railway station itself. You'll find automatic ticket machines inside the airport terminal building, or on the station platform. Again to emphasise: when you buy tickets at the airport or station, make sure you have them punched at the machine you'll find at the front of each platform. This is not necessary with online tickets. 2(b). From Ciampino airport by local train. Unlike Fiumicino, Ciampino does not have a railway station onsite at the airport. 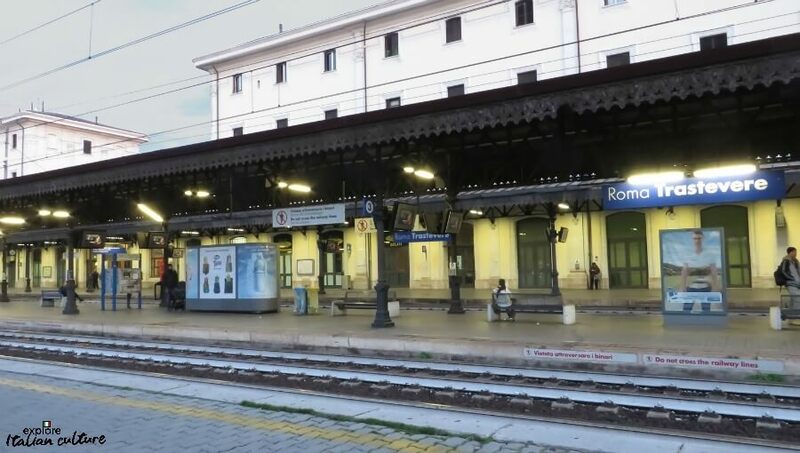 You'd need to travel by shuttle bus from the airport to the station at Ciampino Città (Ciampino town), which takes between 5 and 10 minutes depending on traffic. The bus leaves from both the airport and the station every 30 minutes. You'll find the shuttle stop directly in front of the airport arrivals hall at stand number 2. From there, the train leaves for either Termini station in the centre of Rome, or Tiburtina on the outskirts, every 15 minutes. The journey takes around 15 minutes. The shuttle bus stop at Ciampino airport. The trains have only one stop in between the airport and city. It's a very inexpensive way to travel - the round trip, including the shuttle, will cost about the same as the coach. Waiting for the shuttle when you've had a long and tiring flight can be a nuisance. At Ciampino Città station you'll have some steps to negotiate down to the platform, so if you have a lot of heavy luggage this is not a great option. If you get on the wrong train you'll end up at Tiburtina station which is about three kilometres away from the centre of Rome. You can't book the shuttle service in advance, but you can book the train at this link to the English version of the Tren Italia site. Make sure you search for 'Ciampino', not 'Ciampino airport'. It's much simpler just to book the Terravision coach! 3. The 'Leonardo Express' from Fiumicino airport. Please note : This is an option from and to Fiumicino airport only. This is a high-speed train travelling non-stop between the train station on site at Fiumicino airport and Termini station in the centre of Rome. It runs every thirty minutes and the journey takes around thirty minutes. Regular, efficient and by far the quickest way to travel between the airport and the city centre. 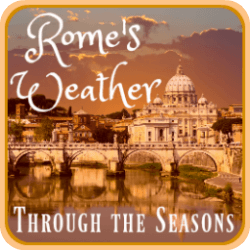 Air conditioning - which, trust us, is critical in Rome's summer heat! If you have booked the Leonardo online and you're flying out of Fiumicino Terminal 3, you can get a reduced rate for the 'Fast Track' security lines. Given the slowness with which security at Fiumicino proceeds, this may well be worth your while. You need to show your online booking voucher to the staff at the main airport information point. For each adult who uses the discounted 'Fast Track' in this way one child under the age of 12 is also admitted free of charge. The unmissable livery of the Leonardo Express at Fiumicino airport railway station. It's more expensive than the coach and the slower trains. Considering it's the main rail link between the airport and Rome, there is surprisingly little room for luggage. It can generally be squeezed in somewhere, but can be a bit stressful if you have a lot of bags. The platform for this train is always number 23/24, which you will find at the far end of the station. Watch out for these signs and allow yourself at least ten minutes to get there. 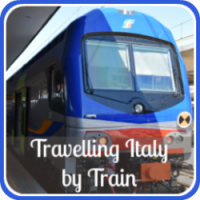 The Leonardo Express can be booked at Fiumicino airport - inside the terminal or at the railway station - or here, at the Tren Italia site - this link is to the English version. Remember to add in the cost of a taxi from Termini station if your hotel isn't within walking distance. 4. Using licensed City of Rome taxis to travel from airport to city. Ignore them! These are not official taxis and you will almost certainly find yourself being well and truly ripped off. Look for the official taxi rank - this one is outside Terminal 2 at Fiumicino airport. Instead, head outside the terminal building (whether you're flying into Fiumicino or Ciampino) and look for the taxi rank ahead of you. 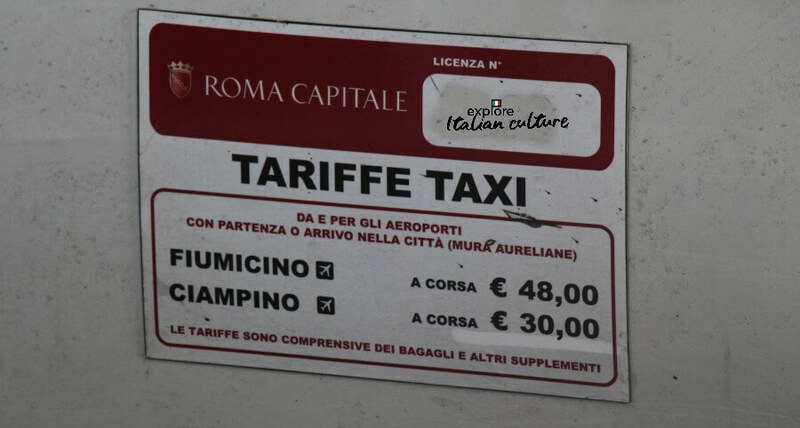 You can recognise the properly licensed Rome taxis by their colour - they're all white - and by the official license badge on the door, underneath which should be the official set rate for both airports. The prices for transfers to and from the airports is fixed by the 'Comune' or Town Hall of the City of Rome, including bags and as many people as can fit in. This fare is to "within the city walls" (including Trastevere and the Vatican area) which most hotels are. An official City of Rome taxi showing rates to and from the airports. Even so, it's not unknown for a few rogue licensed taxi drivers to pull a fast one on unsuspecting tourists. You shouldn't have to, but our advice is always to check the price of the journey with the driver before you get in the cab, and always pay before you get out. If they tell you that's the rate per person, walk away. It's the price for a cab. 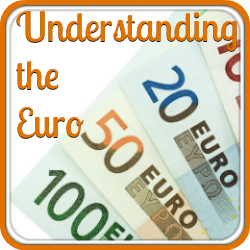 Make sure that, as you produce your Euro notes to pay at the end of your journey, you count them into the driver's hand. On one of our very early trips to Rome, we were ripped off by giving a driver €100 and receiving change for €50 because we didn't do that. Not as expensive as it may seem. If there are four of you it's a cheaper way to travel than the Leonardo Express (from Fiumicino), and more convenient because it takes you straight to your hotel. Riding with a licensed cab is always an unforgettable experience in Rome. The drivers know their way around like the back of their hand and have no fear in terms of changing lanes and entering roundabouts at breakneck speed. Taxis are generally quite small cars so if you have a lot of luggage it may not fit. Sometimes it can be a hair-raising experience - not for the faint-hearted! There is always the possibility of being ripped off. At first glance it might seem that this is going to be very expensive but check the comparative costs, particularly if you're a party of four or more. There are several ways of doing this. You can ask your hotel to book you a car, both from and back to the airport. Some hotels have their own shuttle service, although it's usually expensive. Or you can book online in advance - this is a link from which we get a small commission if you click through and buy. We provide it because it's the way we have chosen to book a private car, particularly for guests coming off a transatlantic flight. From $15 per person, it's a real bargain. These cars may be entirely private - just for your own party - or a less expensive option is a shared mini-van which will take around ten passengers and drop off to different hotels along its route. 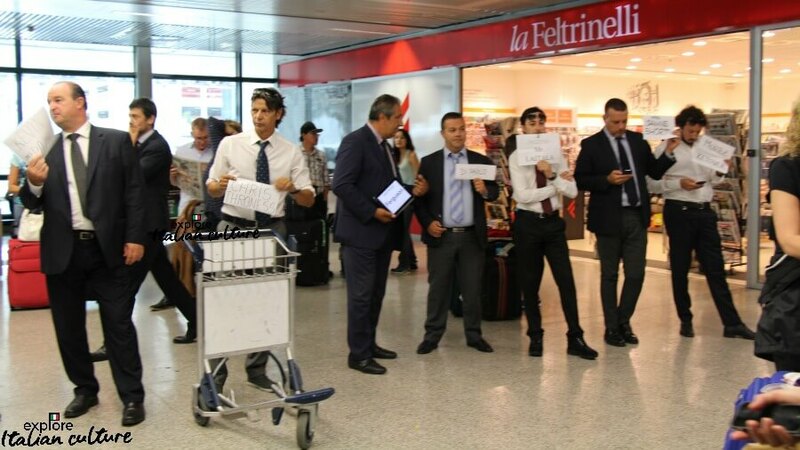 Private hire drivers wait for passengers at Fiumicino airport. It's nice to see a friendly face and a board with your name on it waiting for you when you arrive, particularly if you've never been to Rome before. It's certainly the most comfortable way to travel between the airport and the city, especially if you have a lot of bags and children who are tired after a long journey - or a tiring stay in Rome, for that matter. Generally very efficient, although rush hour traffic can sometimes make it a longer journey. Door to door service with a cost you are sure about. Paying online in advance means you don't need to worry about finding Euros at the bottom of your bags when you first arrive in the country. Drivers speak some English - some of them very well. Many private cars these days have free wifi on board, if your kids can't bear to be parted from their devices. Your driver will be local and generally more than happy to point out different landmarks to you as you travel. 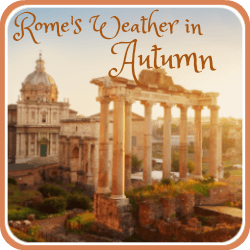 If you go for the shared mini-van option and your hotel is last on the drop off route, you can be in for a long drive (although it also gives you a free conducted tour of Rome!). Can be expensive - but check out the relative costs. You may be surprised. Thinking of private transfer from one of Rome's airports to your hotel? 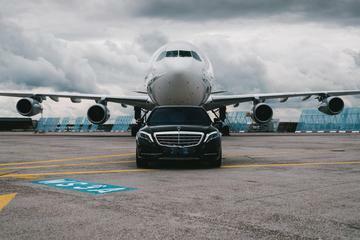 When we have guests arriving in or departing from Rome, particularly on long-haul flights, we use our partner agency, Viator, to provide transport. Viator is part of the Trip Advisor group. 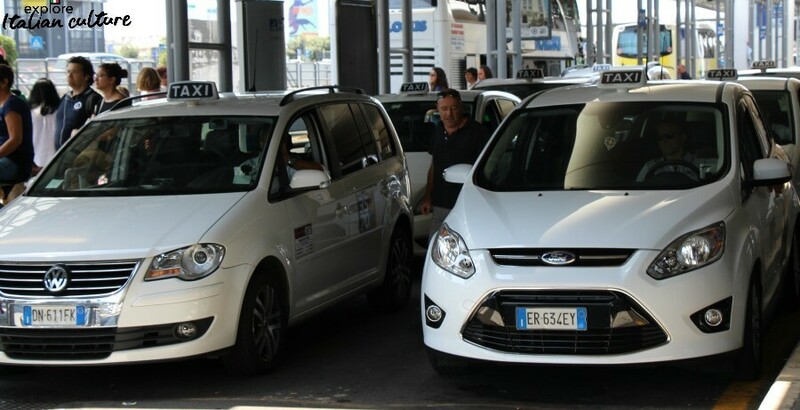 Its prices are very competitive, its drivers are locals who know Rome well, and most importantly they are extremely reliable. Click on the link below to see all the options. This will take you to Viator's website where you can calculate an exact cost and see what other travellers have said about this service. As we say above, we get a small commission from this link if you buy. But we provide the link because we genuinely believe it to be a good option - one we use ourselves. Enjoy a hassle-free welcome in Rome with this private transfer service. Meet your driver at Rome Fiumicino or Ciampino Airport, and be peacefully transferred to your city hotel. These private vehicles can accommodate up to 15 passengers. A note about car hire. Unless you have onward travel from the airport to a destination other than Rome, we strongly, strongly advise you not to hire a car to drive into central Rome. Driving in Italy can in itself be a challenge but driving in Rome - and yes, we have done it! - is an experience you would not want to have if you're looking for a stress-free time. Traffic in the city is heavy and congested; driving, unless you know exactly where you're going, is chaotic and parking is a complete and utter nightmare. 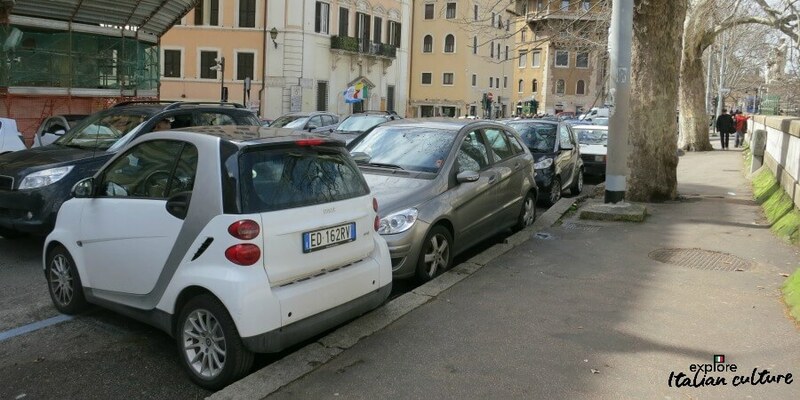 A fairly typical car parking scene in Rome - if it won't fit one way, try another! If you have an onward journey you can leave Rome without having to go near the city, by taking the ring road out of either airport. Otherwise - don't do it! 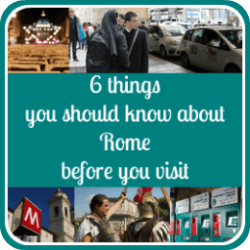 Planning a trip to Rome? Here are some other pages you'll find helpful.